This is an exciting week here! 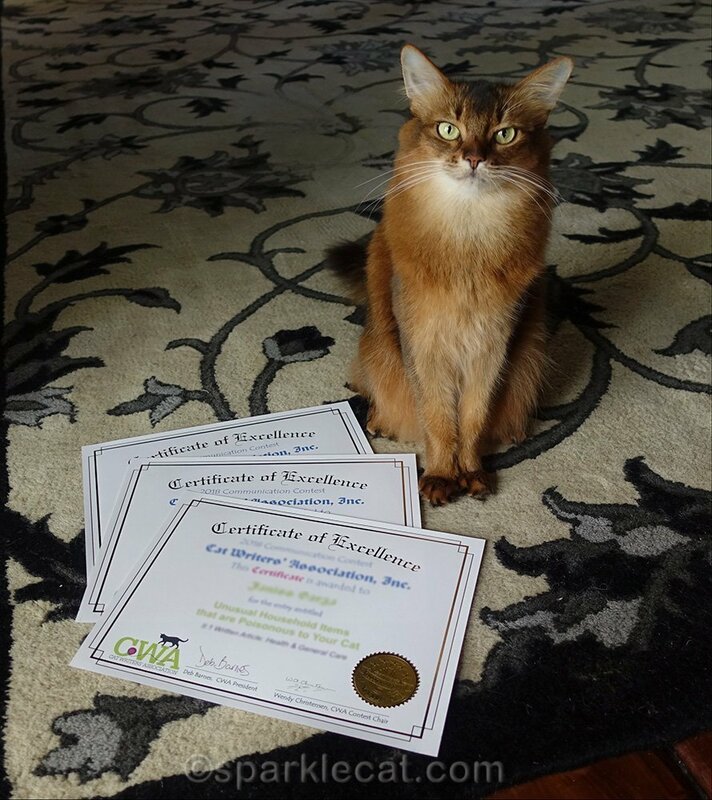 The Cat Writers Association sent out the Certificates of Excellence for their annual contest — and I got some! The CWA contest is judged by professional members of the organization, and they can be tough! I know because my human judges some categories every year. This is probably one of the most important posts I’ve written because some of these items are so unexpected! Who knew that a hair regrowth ingredient could actually kill your cat? So this list is something I think everyone should check out. This is about a program created (not surprisingly) by Jackson Galaxy to help shelter cats get adopted. 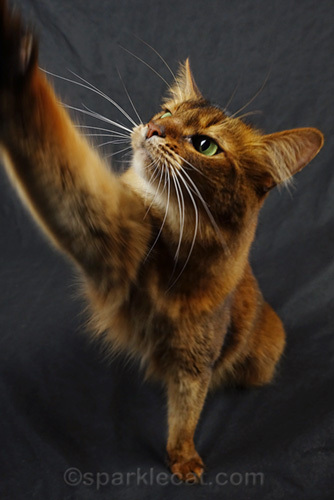 Teaching adoptable cats simple tricks like High Five does two things: it helps them become better socialized, and it impresses people who come in looking for a kitty to take home. 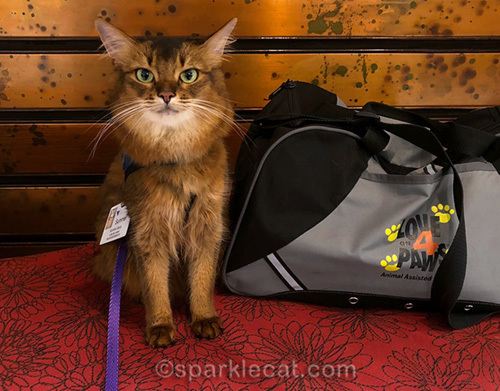 I have always emphasized that learning fun tricks is one of the best ways to enrich kitty lives, and here is proof that is being put to very good use! It is beyond awesome that my posts were acknowledged and rewarded, and I’m so grateful. I hope you check out each post because a lot of heart went into them. Are we surprised? No. CONCATS!! You look so pretty, and Smart, in these pictures! Concats on the well-deserved CertifiCATs, Summer! Congratulations to you and your human, Summer! We are so proud of you! A huge Concatulations to you and your human! It’s wonderdul to see impurrtant posts like these being recognized! Concats on the well-deserved awards. You should send them back so they put the correct name on them. I don’t recognize the first one but remember the other two. Have to go back and read. Pawsome job, Summer! You and your human deserve this honor! Congratulations to you and your human on those well deserved awards. Concatulations! These are so well deserved. 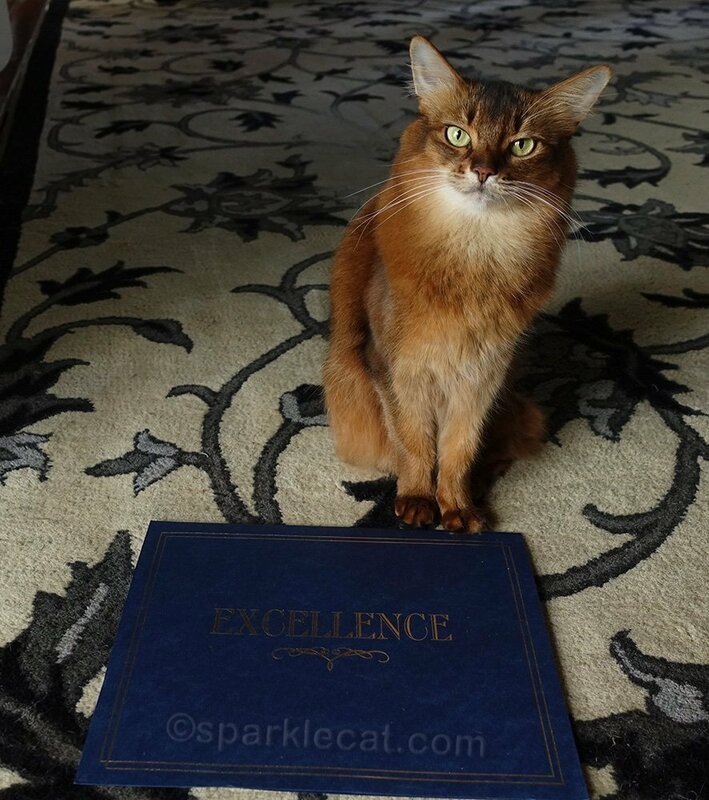 We’re so happy to see that posts that kitties write are winning awards! lexy won one this year for one of her posts! Pawtastic. Our mom is going to share your Cat Pawsitive post with the head of the program so they know you won an award! 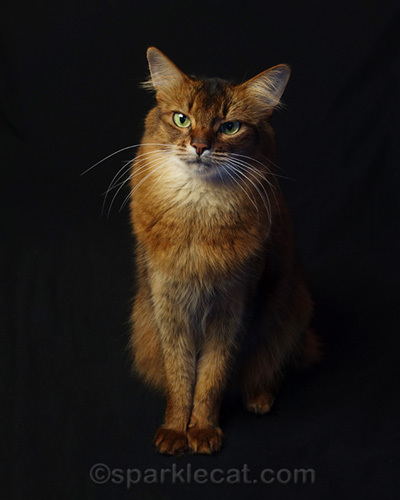 I am so proud of your posts and the fact they can change lives, they can SAVE lives and there is no greater gift to the cat community than this. Helping, guiding, and ensuring cats receive the best treatment and their humans do the best for them is hugely important. Good for you Miss S.
Congratulations – well deserved! You both do such good and important work, you deserve awards on a weekly basis in my opinion. Huge Concatulations to your wonderful and well deserving human!!! Well done Summer to you and your human! Fantastic, Summer! You and your human certainly do good work! Congratulations, Summer. I think your human deserves part of the credit, too. even without the official awards. The awards just confirm the fact! Keep up the good work as you are helping both cats and humans. Well done Summer winning those awards. Well done and well deserved. Congratulations, Summer! They’re so well deserved. Congrats to you and your human, we’re all very proud of you! Congratulations!! It is nice to have your work recognized. We enjoyed those posts and we like being informed about things that affect us. Congratulations Summer! You deserve it!